Don’t expect to hear from me for a while… my submission deadline is the 28th of June and I am panicking. So much work left to do! But, with luck (or hard work), I will be done with this thesis by the end of June. It also means I will be spending every spare moment I have working on it. Right now my mom’s suggestion of just having a baby and going on the benefit seems really appealing… though I think I can make out a light at the end of the tunnel. I just crossed the 70,000 word threshold on my thesis!! 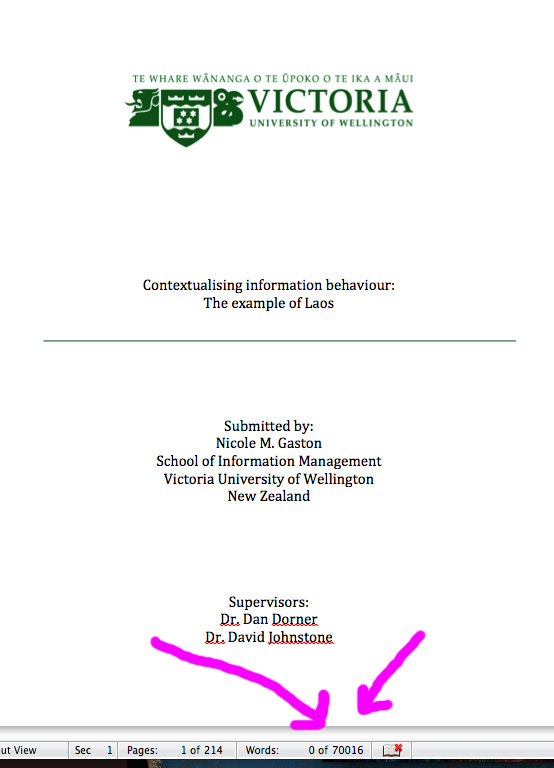 As you may or may not be aware the maximum length for any thesis at Victoria University of Wellington is 100,000 words. That’s a limit, not a target. I don’t want to jinx myself by being too confident, but i feel really good about the progress I have been making lately. My submission deadline is 30 June 2013. Then I guess I have to find a job or something. Apparently I am not officially a PhD until my thesis is bound and the university library has a copy. Realistically that probably won’t be before December of this year. In the mean time, once I submit, I can find some full time work (maybe doing research, teaching, or library stuff? ), try to get a few papers published, and apply for academic jobs starting the following August. Unfortunately, I won’t be done in time to be seriously considered for academic postings starting this August/September, but in a way I don’t think I’ll be ready to pick up and leave Wellington in 6 months. I still have a massive stash of fabric that I have not had any time to make anything with in ages! Also I just got my bike rebuilt. I have 5 more gears now, and I’m looking forward to breaking them on the hills around Wellington!